A black and white large format negative of Dawn and Gail Vickery sitting together in a chair. In this view they are looking to the right. 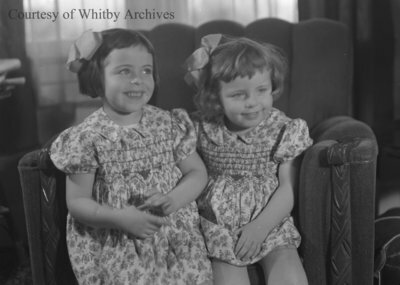 John Wesley Tinwell Vickery was born at Whitby, Ontario on 12 February 1899. He died on 17 February 1977 and is buried at Groveside Cemetery, Brooklin, Ontario. Gwendolyn May Agg Vickery was born 4 April 1902 at Eveham, Worcestershire, England. She died on 11 November 1970 and is buried at Groveside Cemetery, Brooklin, Ontario. John and Gwendolyn married at Whitby, Ontario on 1 January 1929. They had four children: Herbert Joseph Wright, John Ronald, Dawn and Gail. Vickery Sisters, c.1946, Marjorie Ruddy. Whitby Archives A2013_040_462.